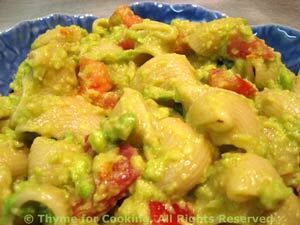 Pasta with Creamy Avocado Sauce, Thyme for Cooking summer side dish. Pasta with a creamy avocado sauce and fresh, chopped tomato. The avocado is heated, just slightly, to make it easier to mash and combine with the other ingredients. You could use milk in place of the yogurt. Cut avocado in half around the pit and twist halves - they come apart neatly. Remove pit by inserting a medium-size spoon under the avocado, on the large end, as if you are lifting the avocado out of the shell. You will see the pit loosen; just tip the avocado over and it will fall out. Remove each half by scooping with a large spoon. Heat oil in a small saucepan. Add the avocado and heat, mashing with a fork or potato masher, chunky is fine. When mashed to your satisfaction, stir in yogurt (or milk) and vinegar. Stir well to combine and remove from heat. Put pasta in a bowl, add avocado sauce and stir to combine. Add tomato and mix in gently. Serve.